Happy Belated First Contact Day! As many of you are probably aware, in 45 years from Thursday, mankind will make first contact with an alien race following the first successful test of human built warp drive. Our future, or course, is still unwritten, but it’s always fun to think about the future seen in Star Trek as our future. Who knows? Maybe we will get to see a real first contact in our lifetimes. For the most part March was a pretty good month for the fleet. Two thirds of our sims finished with an average posting rate of one post per player, or better. That’s up from half of our sims last month, so that’s great to see an improvement. We have several great posts to choose from for the March Post of the Month, so be sure to check them out. We are, unfortunately losing a sim and a CO, but we have a couple of new sims joining us this month. Without further ado, let’s welcome our new COs. First off, taking over for Commander Kevin, Lord Kilbane of Sanquhar on the USS Galileo is Commander Yoraan. Also joining us is a new CO, Lt. Commander Andreas O’Shaughnessy, joining us late this month as commanding officer of the USS Alabama. And finally we have Captain William Hood, also known as Rear Admiral S’iraa, bringing his long running sim, the Ascension-class USS Dreadnought, to Pegasus Fleet. Please give a warm welcome to all of our new Commanding Officers and members! I'm also excited to announce that we have a new Task Force Commanding Officer. Captain Jasmine Lynne Somers, commanding officer of the USS Tomcat, is our new TFCO of Task Force 11. 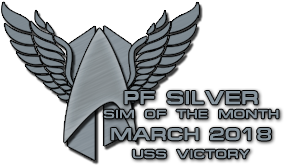 Captain Somers, played by Paul (@Somers on Discord), has been with Pegasus Fleet for many years, and the Tomcat is one of the longest running sims in the Fleet. I look forward to working with him more closely. Welcome to the team! As a reminder, we are still accepting applications for TFCO for Task Force 56. In the meantime, Admiral S’iraa will transition from TF11 to TF56 until the position has been filled. Interested players can apply at the link provided below. Speaking of Admiral S’iraa, as he gets his paws wet in his new role as Chief of Public Relations, he’ll be needing help from the rest of the Fleet. We would like to start prioritizing recruitment in hopes to bring new players and sims to the Fleet. To do this, he’ll be looking for feedback from COs on their sims so as to best represent them, and from everyone in the fleet as to the best places to recruit. Expect to hear more as a plan is developed. Admiral S’iraa knows that he will be interested in forming a recruitment team, though the details of these deputy positions are still to be determined. If you are interested in joining the PF Staff and helping with recruitment and other aspects of the Public Relations department, be on the lookout for further announcements. This month's meeting will be this Sunday, April 8, at 3:00 pm EDT. It will be held in the #meeting channel of the Fleet Discord Server, and is open to all current and prospective members of the fleet. Everyone is encouraged to attend. Since different parts of the world have different Daylight Saving Time rules, be sure to double check what time the meeting starts for your time zone. Because of the Mother’s Day holiday in the US, the next meeting will be held on the third Sunday of the month, on Sunday, May 20. For the March Post of the Month, follow the link below, check out the nominated posts by clicking "[READ HERE]" next to each nominee, and vote for your favorite. Voting will close on Saturday, May 12, so be sure to make your voice heard. Commanding Officers, be sure to remind your crews so that we don't miss anyone.